Dear Father Kerper: In one of your letters the Act of Contrition came up in the question and in your answer. I’m embarrassed to say that I have no idea what the Act of Contrition is. What is it, and why is it so important? Please don’t be embarrassed by asking. Your great question reminds me that at times priests use specialized terms and assume that everyone knows what they mean. So thank you for leading me to be clearer in these responses. So, what is the Act of Contrition? On one level, it’s a formal prayer recited during Confession, usually right before the priest says, “I absolve you from your sins, in the name of the Father, and of the Son, and of the Holy Spirit.” In some settings, it may be prayed before or after Confession. And it can also be prayed apart from Confession, especially before going to bed. Please understand, however, that the Act of Contrition is not primarily a magical formula rattled off thoughtlessly to guarantee instant forgiveness. Rather, it expresses in words a deeply personal act that engages a person’s affections and will. The words, no matter how accurately they may be recited, do nothing without the act. This act has three essential steps. We discover these by taking apart the most traditional form. “Contrition” comes from the Latin contristare, “to be with sadness.” And so we begin the prayer by saying, “O my God, I am heartily sorry for having offended You.” Here we express to God our feeling of sadness that flows from our honest acknowledgment of sin. This sorrow, which is an emotion rooted in the heart, is the first step toward forgiveness. Indeed, without this emotional response to offending God, we would never bother to confess our sins at all. This article is from a chapter in A Priest Answers 27 Questions. Click image to preview or order. The prayer mentions two types of sorrow. This first is based on fear. We say, “Because of Your just punishments.” The second arises from genuine love of the Lord. We say, “Because [my sins] offend You, my God, whom I should love above all things.” Classical Catholic theology called the first type “imperfect contrition” and the second type “perfect contrition.” Although we should always try to stir up genuine sorrow motivated solely by our love of God, the sadness that comes from fear of punishment and recognition of the foolishness of sin is sufficient to turn us to the Lord, who longs to forgive us. After expressing our sorrow, we then turn against sin itself by saying, “And I detest all my sins.” This hatred of sin is absolutely necessary because the love of God cannot coexist with any lingering “love” of sin, even the slightest. In other words, no one can strike a cozy compromise between God and sin, trying to keep both as part of one’s life. This, of course, doesn’t mean that all sin will disappear instantly. It won’t. Rather, although sin may persist, we must always disdain and resist it. This bring us to the most difficult step. Every authentic Act of Contrition must include a solemn promise to stop sinning. The traditional form has these words: “I firmly resolve with the help of Your grace to sin no more and to avoid the near occasions of sin.” Many people, of course, balk at this promise, pleading, “I am only human and will inevitably sin again. Should I still make such a promise?” Yes. This promise sets one’s will firmly against sin. As such, it repre­sents a free and conscious turning away from sin and toward God. This reaffirmation of one’s basic commitment to God is essential. Without it, a person forever straddles the fence between God and sin. Even worse, confessing a sin while planning to commit it again blocks God’s forgiveness. This reduces the sacrament of Penance to a “license to sin.” Some people, unfortunately, ensnare themselves in a pattern of serious sin followed by Confession, then they repeat the sin, go to Confession again, and so on. This usually means that the firm purpose of amendment is lacking and that the sinner has seriously misunderstood how the sacrament of Penance works. Now, please note the phrase “to avoid the near occasions of sin.” This is crucial for any strategy to keep the promise to stop sinning. The term “occasions of sin” refers to people, places, and things that we know result in sin. Examples abound: someone with a drinking problem should not go to cocktail parties; someone who gets furious about current affairs should not listen to radio talk shows; someone who has trouble with chastity should not have easy access to the Internet; someone who slanders other people should not sit with people who enjoy gossip. As you can now see, the Act of Contrition is much more than a set prayer. In a true sense, it stands at the very center of Christian life, which began on the day of our Baptism. At that time our parents and godparents formally renounced sin on our behalf. In effect, they declared that sin and God’s grace are completely incompatible. Whenever we say the Act of Contrition, we reaffirm that essential truth, express our sorrow for past sins, and declare our hope that God’s grace will surely triumph within us. 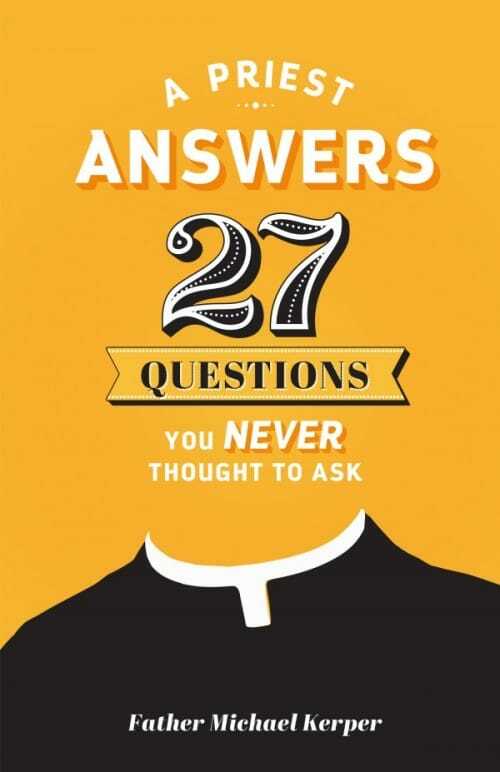 Editor’s note: This article is from a chapter in A Priest Answers 27 Questions You Never Thought to Ask, which is available form Sophia Institute Press. Father Michael Kerper grew up in Philadelphia, attended Catholic schools as a boy, and then studied politics and economics at La-Salle University, labor relations at the University of Massachusetts at Amherst, and moral theology at Mount St. Mary’s Seminary in Emmitsburg, Maryland. Ordained in 1985 for the Diocese of Manchester, Father Kerper has worked as a parish priest throughout New Hampshire.